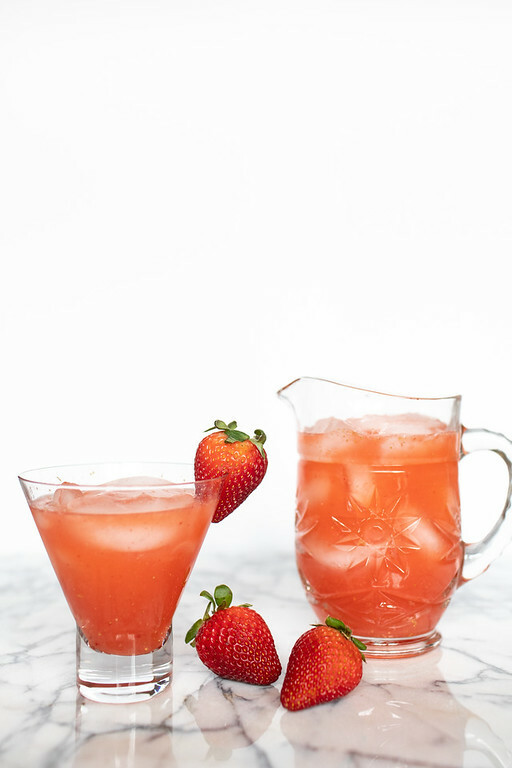 Make a pitcher of these easy strawberry margaritas and sit back and enjoy this delicious tequila cocktail. 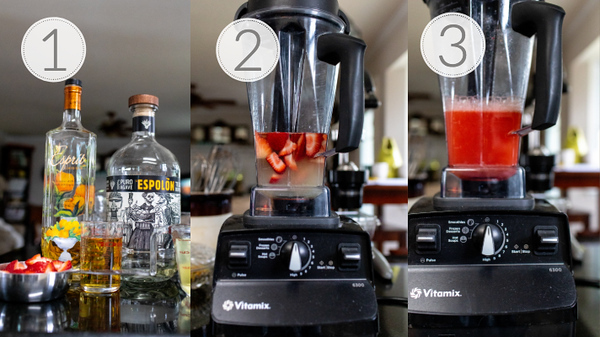 Sweet fresh strawberries, fresh limes, tequila and orange liqueur. This will become your go to spring and summer cocktail! Strawberry Margaritas by the Pitcher! The only thing better than a refreshing strawberry margarita is a pitcher of strawberry margaritas! I love this recipe, it makes 4 generous margaritas and can easily be doubled if you want even more. For my husband and I the pitcher of margaritas was just perfect. It’s no secret that I adore margaritas. We have Blood Orange Margaritas all through blood orange season (and I’ve frozen some blood orange juice so that I can enjoy them any time I want.) This Orange, Lemon and Lime Margarita is a classic that never goes out of style. 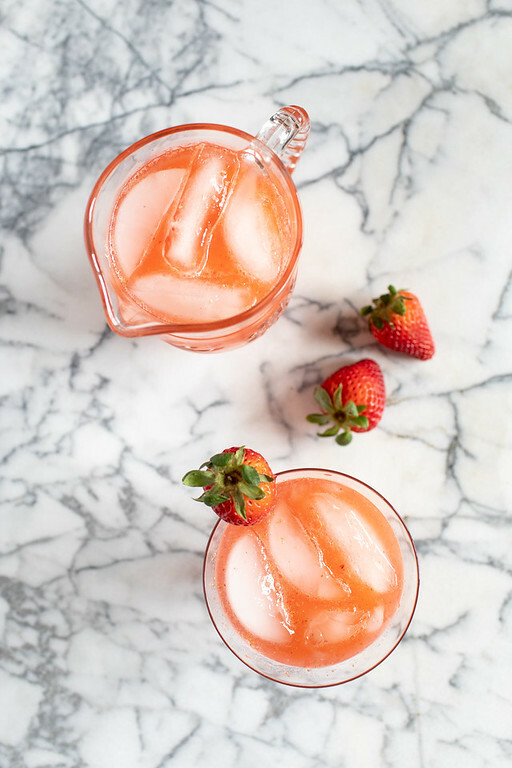 I’ve got lots of other margarita recipe ideas in the works, but for now, sit back and enjoy a pitcher of these oh-so-delicious strawberry margaritas. Step 1 – Gather you ingredients. Use your favorite orange liqueur (my Homemade Orange Liqueur would work nicely,) your favorite tequila, a cup of cored and quartered strawberries, and two limes juiced. Tip – before juicing the limes, zest them and store in a bag or jar in the freezer. Use them in recipes that call for lime zest! Step 3 – Process until smooth. Tip – you can serve these over ice, with or without a salted rim. To turn it into frozen strawberry margaritas – add 6 cups ice cubes last into the blender and process until smooth. The difference between a strawberry daiquiri and a margarita is that a daiquiri contains rum and a margarita contains tequila. Other wise they are very similar. My Frozen Strawberry Daiquiri has strawberries, lime juice, and orange liqueur just like this margarita. However, it contains rum as the liquor and it also has a little sugar in it. It’s also crazy delicious and so easy! To check out even more strawberry recipes, be sure and follow my Strawberry Recipes Board on Pinterest. This delicious and easy strawberry margarita recipe makes a pitcher, so you'll have plenty to enjoy! Add the tequila, orange liqueur and lime juice to blender. Pour into a pitcher filled with ice. Tip - before juicing the limes, zest them and store in a bag or jar in the freezer. Use them in recipes that call for lime zest! Tip - you can serve these over ice, with or without a salted rim. To turn it into frozen strawberry margaritas - add 6 cups ice cubes last into the blender and process until smooth. Super cute photos! They look super yummy. What a gorgeous colour the strawberry gives the margarita! Just superb – and so delicious! It is so pretty and it tastes as good as it looks! I never thought of orange liqueur in my margaritas. It sounds amazing with the fresh strawberries!! Yum! Yum! Oh, you have to try it, it’s so good! These look so pretty and so refreshing! Do you have tips to make this, just as delicious but non alcoholic? You could substitute orange juice for the orange liqueur and sparkling water for the tequila to give you a fizzy orange strawberry mocktail.